Duplicate Some Of My Covers As Well as when playing my Custom Fender Fretted 4 String. And I installed a fender p-bass pickup in the neck position and a bass lines Jazz pick up in the bridge spot. With a simple volume for each and a common tone pot for the whole sound. Kinda like A p/j setup you would see on a factory made bass guitar. But the pickups I used are just some i had laying around, Nothing pre engineered or anything like that. I must say im happy with the results. Be Kind Its My First Bass Guitar Build ! Despite the fact that frets were added to lutes and sitars centuries ago, the acoustic bass (also known as the “really big cello”) is still fretless today. And if it wasn’t for Leo Fender, the electric bass would be fretless too. So there is a lot of history behind playing fretless. However, from the 50s through the 80s, it was very rare to find fretless players in rock bands. The goal was to get that solid, punchy sound and increase the sustain. And given the increased volume on stage, playing fretless was probably very risky, as you couldn’t hear yourself. But as the 90s progressed, musicians became more interested in returning their sound to “the old days,” while looking for a distinctive tone. The acoustic guitar made a big comeback in rock, thanks to improved pickups and pre-amps. And the fretless bass made a quiet return as well. Tony Franklin made fretless fit on a hard-rock album with The Firm. And Kevin McCormack practically invented the early Melissa Etheridge sound with his slap & pop fretless work. Sting, Mark Egan, Bill Wyman, Ron Carter, Mike Karn, Pino Paladino, Boz Burrell, Rick Danko(! ), Jack Bruce (but not in Cream), John Deacon, Percy Jones, Steve diGiorgio, Billy Sheehan, Jeff Ament, Baghiti Khumato (Paul Simon’s Graceland). Thanks to the gang at ActiveBass for helping to compile this list. As explained in Tone Loco, the absence of a hard fret to anchor one end of the string causes the highest frequencies to be reduced. In addition, the string vibrating under your softer fingertip will have less sustain. In an upright bass, this creates a slightly thumpy sound, with little sustain. If you listen to some classic jazz, you may notice the bass player accentuating the lack of sustain by muting the strings, isolating each note. Modern fretless basses benefit from better strings and pickups, so the tone is not quite so limited, and reasonable sustain can be achieved. I can get either a round, smooth sound or a warm, sax-like tone from my Jazz bass with my silk-wound strings. I often select my fretless just to get the best tone that matches the song. If you install round-wounds you can even get a bright rock sound. Of course, the biggest difference is that you have to figure out almost exactly where to put your fingers to fret the note perfectly. Most fretless necks have locating dots on them at the 3rd, 5th, 7th, 9th, and 12th frets, but even then it can be difficult to locate the right spot for the 1st or 11th fret. This requires a reasonably good ear, and practice. However, it’s not overly difficult to learn how to adjust. Some necks come with fret lines embedded in the neck, usually with a similar piece of wood going cross-ways where the fret should be. I’ve even seen a neck where the fret lines were done with a maple (white) stripe across a rosewood neck. It looked ugly to me, but at least you know where to put your fingers. One of the really fun things to do with a fretless is to slide. As shown in Two by Two, the bass riff for Walk on the Wild Side just begs for fretless sliding. But you can also replace a hammer-on with a slide. Sliding is always noticed (which is why trombones are cool, too), even when playing simple notes, so use it carefully. But, it can really improve a boring transition. Remember that when you slide up, the volume gets louder, and when you slide down it gets softer. Also, you can get a tremolo effect by wobbling your fingertip up and down the neck, just like the violinists do. (Hey, they play fretless too!) Be aware that this can reduce your sustain a bit. Ever notice how lead guitarists bend their strings? Ever try to bend your bass strings? It’s very difficult. But with a fretless, you can get the ¼ and ½ pitch changes by sliding up only part way to the next fret location. What You Have not discovered, Right ? In the current musical climate, slap and pop depend on bright strings and extreme EQ to produce a jangly noise created by banging the strings on the frets. But there are times when you may use these techniques for speed and range, not just to cut through the noise. Besides, you can still get a very cool sound by slapping on your fretless, as the string hits the entire length of the neck. It’s not going to be as “metallic” as a fretted bass, but it’ll be a sound change you will definitely notice. 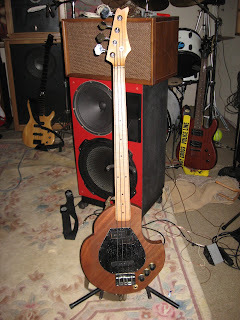 you will demand your fretless for certain songs…. but it is an intriguing idea. I recommend a Jazz-style bass, as the two pick-ups give you much more flexibility for your tone. However, the classic P-bass and other single pick-up designs may match that certain sound you’re looking for. Read How to Buy a Bass Guitar for details. Some people claim that you should never use round-wound strings with a fretless bass, because they chew up the neck. This is only partially true. If your fretboard is made of ebony or maple, then it won’t matter, as these are extremely hard woods. If you have rosewood or other material on your neck, you may find that round-wounds will leave grooves in it. Of course, since you’re going to be sliding a bit, round-wounds may be a bit tough on your fingers. Ground-wounds, half-rounds, or flat-wounds are good. Traditionalists think that a single pick-up and flat-wound strings will give you that “classic” thumpy sound. I use silk-wrapped round-wound strings, which are brighter than flats or nylon tape wound, and feel nice under my fingers. Read the rest of this site for a more technical discussion of strings and how they affect tone.